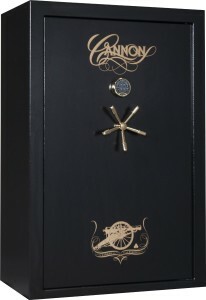 Cannon gun safes provide great value for keeping your guns and valuables secure. Because they are such a great protection for its contents, many people who have bought them became satisfied customers. In this article, we’ve listed down the gun safes that got the best Cannon gun safe reviews of 2016. 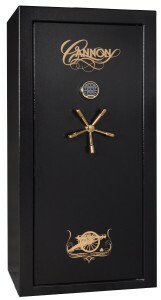 You can get the best value from the Patriot series of safes which are available in varying sizes. It is finished in a durable matte paint and has been produced with the quality for storing valuables and possessions. Sturdy steel construction that features a 3 spoke handle. Can hold up to 48 rifles. 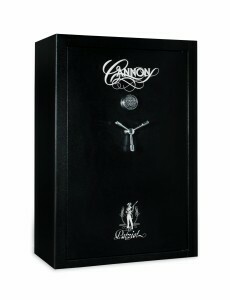 The Cannon Safe CA33 Cannon Series Deluxe Fire Safe is an elegant unit, secure, tested fireproof safe. It can withstand a maximum of 1200 degree F temperature for up to 60 minutes of fire exposure as tested by Intertek. It’s made of high-quality materials, such as the 4-inch thick double steel composite door, its beveled edge body, 3-spoke handle and the titanium-plated locking bolts. On the inside, you can see the Tru Rack system, adjustable shelving and customizable space that provides a great storage environment for your valuable items. It also has one-inch active locking bolts with triple hard plate that protects the lock. Steel construction featuring titanium locking bolts and a 3 spoke handle. Electronic lock that is commercial grade type 1 UL rated. Fireproof at 1200 degrees for 30 minutes. Internal power supply that provides 2 100v outlets, RJ45 Ethernet connection and a USB port. The best Cannon safe reviews indicate how beautiful this unit is, and how nicely it fits in with furnishings. On the outside, you can see the handmade finish and the high quality of craftsmanship of the Cannon series. The safe can contain up to 36 guns. You can easily store your firearms and other valuable possessions and feeling rest assured of their safety. Fire protection approved by ETL. 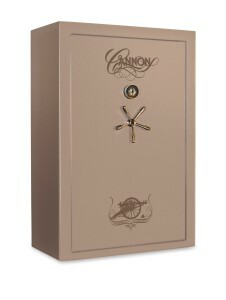 The cannon safe CA23 Cannon Series Deluxe Fire Safe has also some of the best Cannon gun safe reviews to date. It features the high quality of workmanship and durable materials, which had been tested by Intertek at 1-hour/1200 degree F. temperature fire rating. It has a five-spoke handle and titanium-plated locking bolts that boost the overall quality of the safe. It’s fortified 4″ thick steel door adds to the safety and security of your prized possessions. It features adjustable shelving and multifunctional storage area using the Tru Rack system. Along with its robust capabilities, its exterior looks elegant and is great for beautifying the home. Moreover, it surpasses the California DOJ requirements for firearm safety. Robust construction that features a 5 spoke handle, Cannon’s patented TruLock Internal Hinges, 2 sided door bolt protection and Six 1.5″ steel bolts. Another reason why the cannon safe CA23 Cannon Series Deluxe is listed in the best Cannon gun safe reviews is because of its stunning design that can add beauty to your living space. Electronic lock supported by a triple hard plate with dual re-lockers. ETL verified, 1-hour fire protection in 1200 degrees F.
A built-in power supply that provides 2 110V outlets, RJ45 Ethernet connection and USB port. It also features a door organizer to maximize the storage space. Capacity to store up to 24 guns. Last but not least in the best Cannon gun safe reviews is the Cannon Safe CA33-H3FDB-13 Cannon Series Safe, with extensive features that compete with more expensive brands. This elegant unit has a high fire protection rating and keeps up to 36 guns and other valuables safely secured within your home. Beauty and functionality. The best Cannon safe reviews reveal that the Cannon Safe CA33-H3FDB-13 Cannon Series Safe is a stunning unit with its hand-crafted finish and elegant design. Large storage space. You can store up to 36 guns in this unit, which is a great deal for gun enthusiasts. You can be assured of the safety of your firearms and other valuable possessions that used to be difficult to secure with smaller safes. Capacity to store 36 guns.